The defender uses the thumb strike to the throat (Figure 4-3) as an effective technique when an opponent is rushing him or trying to grab him. The defender thrusts his right arm and thumb out and strikes his opponent in the throat-larynx area while holding his left hand high for protection. He can follow up with a disabling blow to his opponent's vital areas. (3) Thumb strike to shoulder joint. The opponent rushes the defender and tries to grab him. The defender strikes the opponent's shoulder joint or upper pectoral muscle with his fist or thumb (Figure 4-4). This technique is painful and renders the opponent's arm numb. The defender then follows up with a disabling movement. (4) Hammer-fit strike to face. The opponent rushes the defender. The defender counters by rotating his body in the direction of his opponent and by striking him in the temple, ear, or face (Figure 4-5). The defender follows up with kicks to the groin or hand strikes to his opponent's other vital areas. (5) Hammer-fist strike to side of neck. The defender catches his opponent off guard, rotates at the waist to generate power, and strikes his opponent on the side of the neck (carotid artery) (Figure 4-6) with his hand clenched into a fist. This strike can cause muscle spasms at the least and may knock his opponent unconscious. (6) Hammer fist to pectoral muscle. When the opponent tries to grapple with the defender, the defender counters by forcefully striking his opponent in the pectoral muscle (Figure 4-7). This blow stuns the opponent, and the defender immediately follows up with a disabling blow to a vital area of his opponent's body. (7) Hook punch to solar plexus or floating ribs. The opponent tries to wrestle the defender to the ground. The defender counters with a short hook punch to his opponent's solar plexus or floating ribs (Figure 4-8). 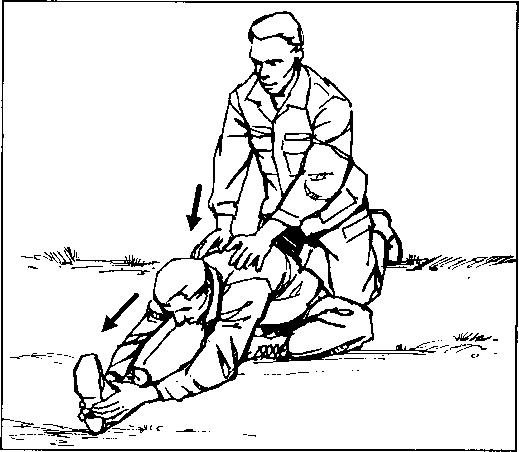 A sharply delivered blow can puncture or collapse a lung. The defender then follows up with a combination of blows to his opponent's vital areas.